The Refined Feline Litter Box In Mahogany. Features of the The Refined Feline Litter Box In Mahogany. Internal plastic litter liner with high walls. Contains litter for easier clean up. Reversible walls for left or right entry. Fits electric litter boxes including LitterMaid Elite, LitterMaid Elite Mega, ScoopFree, and Petmate Purrforma. Description of the The Refined Feline Litter Box In Mahogany. 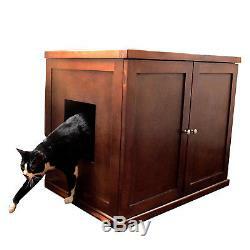 Refined Litter Box-xLarge-Mahogany SKU: P5027657. Petco Ecommerce Return 257 Prospect Plains Road, Ste. With more than 50 years of service to pet parents, Petco is a leading pet specialty retailer that obsesses about delivering health and happy experiences for pets and the people who love them. We do this by providing the products, services, advice and experiences that keep pets physically fit, mentally alert, socially engaged and emotionally happy. Everything we do is guided by our vision: Healthier Pets. The item "The Refined Feline Litter Box In Mahogany" is in sale since Tuesday, May 29, 2018. This item is in the category "Pet Supplies\Cat Supplies\Litter Boxes". The seller is "petco_animal_supplies" and is located in San Diego, California. This item can be shipped to United States, Canada, United Kingdom, Denmark, Romania, Slovakia, Bulgaria, Czech republic, Finland, Hungary, Latvia, Lithuania, Malta, Estonia, Australia, Greece, Portugal, Cyprus, Slovenia, Japan, China, Sweden, South Korea, Indonesia, Taiwan, South africa, Thailand, Belgium, France, Hong Kong, Ireland, Netherlands, Poland, Spain, Italy, Germany, Austria, Israel, Mexico, New Zealand, Philippines, Singapore, Switzerland, Norway, Saudi arabia, Ukraine, United arab emirates, Qatar, Kuwait, Bahrain, Croatia, Malaysia, Brazil, Chile, Colombia, Costa rica, Panama, Trinidad and tobago, Guatemala, Honduras, Jamaica, Antigua and barbuda, Aruba, Belize, Dominica, Grenada, Saint kitts and nevis, Saint lucia, Montserrat, Turks and caicos islands, Barbados, Bangladesh, Bermuda, Brunei darussalam, Bolivia, Ecuador, Egypt, French guiana, Guernsey, Gibraltar, Guadeloupe, Iceland, Jersey, Jordan, Cambodia, Cayman islands, Liechtenstein, Sri lanka, Luxembourg, Monaco, Macao, Martinique, Maldives, Nicaragua, Oman, Peru, Pakistan, Paraguay, Reunion.